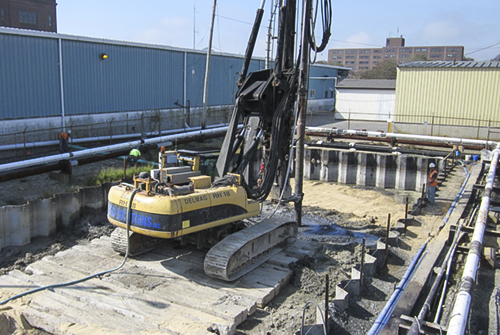 The purpose of this project was to use single auger soil mixing to solidify MGP impacted dredge sediments. 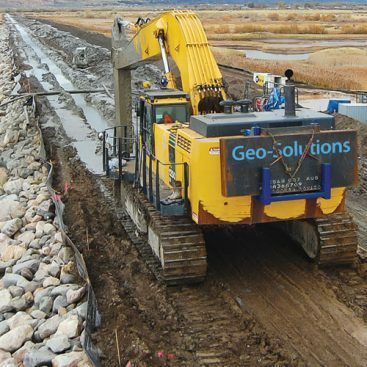 Geo-Solutions was subcontracted to complete all of the soil mixing work. 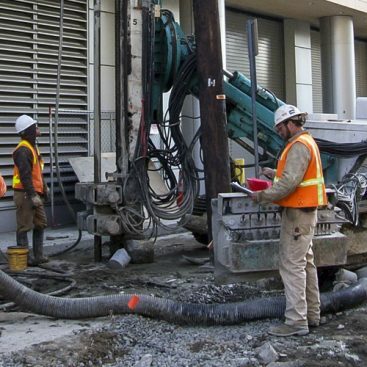 The soil mixing required the installation of one hundred and seventy eight 8 feet (2.44 m) diameter and thirty two 3 feet (0.91 m) soil mixed columns to depths of 15 ft-32 feet (4.6 m – 9.6 m) below workpad elevation. A column layout for the soil mixing work is shown below. All of the soil mixing work was completed using Geo-Solutions’ Delmag RH-18 drill rig, batch plant, and silos (pictures to the left and below). 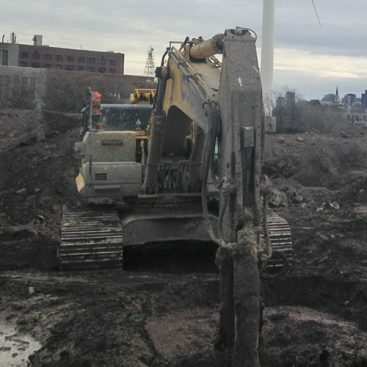 Prior to Geo-Solutions’ arrival, the dredge sediments were placed within sheetpile cells. The stabilization took place within the sheetpile cells using timber mats for rig stability.